For me, St Petersburg FL has everything you could want in a city. Located on the Pinellas Peninsula, it is a beautiful setting for anyone looking for an active, interesting, and easy-paced life. Bordered to the east by Tampa Bay and surrounded by the Gulf of Mexico on the west, St. Pete maintains the charm of Old Florida while being firmly planted in the 21st century. Nicknamed the "Sunshine City" because of the average 360 days of sunshine each year, St. Petersburg is like a mystical magnet drawing tourists and retirees to its semitropical climate, it's proximity to the Gulf Beach barrier islands, the overwhelming amount of choices for activities, and its concentration on fine arts amid a beachcomber spirit. To me, the opportunity for outdoor athletic pursuits, finding subjects to photograph, and watching a sunset from a different little beach bar each evening is unparalleled. And, I can do them all without haste or stress. Joan Seers, a writer and photographer, said, "St Petersburg FL is the most charming town on the Gulf Coast. I have lived here for the past 20 years, and I fall in love with it more each year. I can wake up in the morning, jog down to St Pete Waterfront Park path, and take a photo of the sun rising over Tampa Bay. Then, I can go have dinner over at Caddy's or Sloppy Joe's on Treasure Island, and take a picture of the sun setting over the Gulf Of Mexico. My friends back in Brainerd MN cannot believe I live in such a paradise. They love the pictures I send them." Her friend, Trudy Evans, who is a waterfront artist agreed. "The charm of St Pete is completely off the scale. Where else can you see such beautiful sailboats parked right on the edge of the city? There are so many fun little restaurants downtown, and I love the assortment of unique beach bars over on the barrier islands. I can jog along the waterfront park in the morning, do some painting in North Straub Park after breakfast, take a little nap, then head over to Treasure Island for some late afternoon sun. All I have to do is pull on a wrap-around skirt and a fun top, and I can meet my friends for dinner at either of those places Joan just mentioned. Where else can you do something like that in the winter? 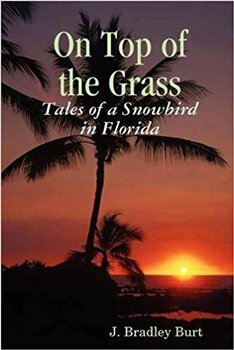 A Florida snowbird life is well-lived in St Petersburg FL." 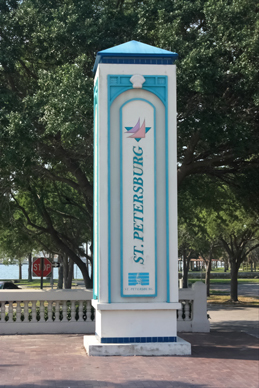 Although St Petersburg FL is well recognized for its closeness to the Gulf beaches, its downtown area features a seven-mile waterfront park system along Tampa Bay that is the largest public waterfront park system in North America. Almost every morning, and throughout the day, it is frequented with runners and walkers in this peaceful, beautiful setting. Marinas, small beaches, and the St. Petersburg Pier define this relaxed natural setting. Only a few blocks away are great places to eat, museums and galleries, upscale bars, and unique small shops. Accommodations in St Petersburg FL run the gamut from extravagant luxury to affordable motels. Many visitors to the Gulf Beach barrier islands stay in St. Pete to experience more of a cosmopolitan atmosphere, yet enjoy the casualness of the Florida beach lifestyle. Joe and Judy Hines are two snowbirds who love downtown St Pete. "This has everything we could want in a downtown area. We love the beautiful parks, We can walk all along the waterfront pathway, stop and talk or read on the benches in each of the parks. It's wonderful," said Judy. "Each of these little parks has its own personality. The breeze is gentle on the winter mornings, and the sun feels so warm on my face. I love inhaling the clean salt air off Tampa Bay. There is not much traffic or noise before 9:30am." Her husband Joe said, "I love all of the little pizza places down here. We spent the first 20 years of our marriage in Chicago, so Friday-night pizza was pretty much part of our normal routine. We still keep it up here. What makes it nice, though, is that a lot of these little places have a few outdoor tables, and they sell pizza by the slice. We get to have a wonderful, cheap dinner, outside...and we get to people-watch. Everybody seems so friendly. We rent an AirBnB place for 5 months, and stay right in downtown St Pete. We also like to picnic over at Albert Whitted Park. You can sit right on Tampa Bay and have a wonderful afternoon meal. There is so much to talk about with each other, and so much to be thankful for. 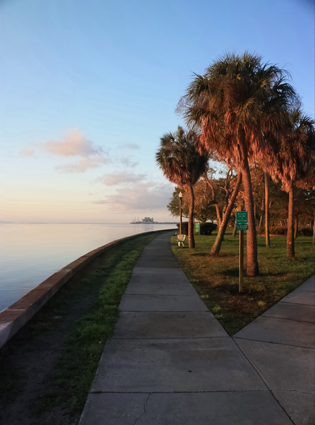 Being a snowbird in St Petersburg FL is one of the greatest things that has happened in our lives." "Where should a health city be built? Overlooking the deep Gulf of Mexico, with the broad waters of a beautiful bay nearly surrounding it, but with little upon its soil but primal forest, there is a large subpeninsular, Point Pinellas, waiting the hand of improvement. It lies in latitude 27 degrees and 42 minutes, and contains, with its adjoining keys about 160,000 acres of land. No marsh surrounds its shores or rests upon its surface; the sweep of its beach is broad and graceful, stretching many miles, and may be improved to an imposing extent. Its average winter temperature is 72 degrees. Those who have carefully surveyed the entire state think it offers the best climate in Florida." Due to the huge amount of publicity this presentation generated, many physicians visited the area and returned to their communities boasting of its beauty. Now, over 100 years later St Petersburg FL is still seen as Paradise.